Favorite Productivity Tool: UNUM is my go-to, considering most of what I do is posting to Instagram. Most Recommended App: Over! I accidentally downloaded it and it has made a huge difference. Canva is great, but paying for Over has helped me create really killer graphics for my Instagram stories and posts. Last Thing You Read: The Emily Weiss feature in Entrepreneur Magazine. Obsessed with her. As much as I hate to admit it, I really hate books. Hate's a strong word, but shamefully justified in this situation. I get a little stir crazy when I sit down to read, and unless I make it through half the book, I can never get hooked. I'm more of a magazine, podcast and book on tape girl. The Morning Breath is my guilty pleasure podcast, 100%. Absolutely not the most educational podcast, in fact, the most you'll learn is who gave who their rose on the Bachelor, but I'm constantly cracking up at those two girls. Humor sells. Tell us about your journey? I tend to call ATL Girl Gang my happiest accident. One day, I was searching for photographers and web designers online to help with a little side project. After lots of dead ends on Google searches, I tried Instagram, totally confident there would be a Girl Bosses of Atlanta account or something similar. When I had zero luck once again, I figured: why not start one? Two weeks in, with very little effort, the account was growing quickly. That's when I knew there was something missing in Atlanta and this account may have just filled that gap. Naturally, as a lover of social gatherings and hosting, I wanted to throw a party. That's where the first Launch party came into play. The event was spectacular and really got the account going in the right direction. 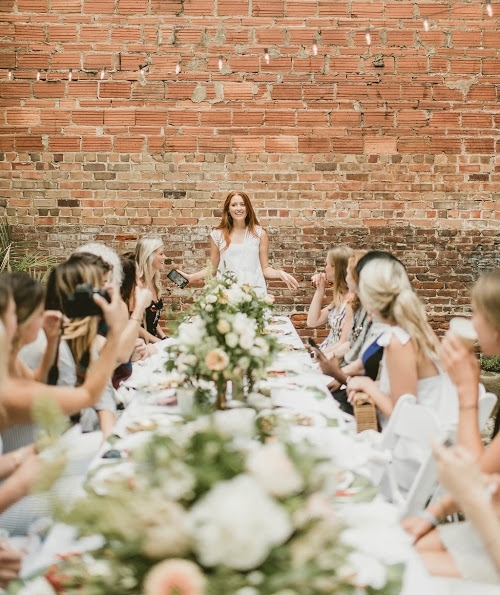 From there, it's been all about listening to the ladies of ATL, picking and choosing which events will provide the most value for everyone, and then executing them perfectly with the help of amazing local girl bosses. What what's your favorite part of your day? ATL Girl Gang is my side hustle, if you will. My day job is in sales and keeps me busy most of the standard business hours. Since starting Girl Gang, I'm in a new habit of working out at 5:30 AM - never thought I'd see the day! I'm usually home around 6:45, which gives me about an hour before my day truly starts. That is by FAR my favorite time of the day. I typically sit there with my coffee for the entire hour, Good Morning America in the background, and knock out as much Girl Gang work as I can. Nothing like starting your day off on the right note. When do you feel most successful? After our Girl Gang events. There is no feeling like coming home after we've successfully pulled off an event. Seeing a bunch of local girl bosses, who for the most part, have never met, come together to create a killer event, is just incredible. It truly feels magical when you hear girl after girl say that they made a new friend at the event or they have a new collaboration in the works, all because of what you coordinated. Can't say enough about how cool that feeling is. What do you do to recharge when you’re feeling drained? This is one that I'm still working on. Having a full-time job and this side hustle can get exhausting. As much as I wish this wasn't the answer....working out solves it all. I can be dragging all day, doubting things, questioning myself, etc. etc. But then I force myself to go on a run or to a workout class and come home with more energy than ever. Truly a game-changer for me. What do you know today that you wish you would have known when you first got started as an entrepreneur? It's only been about 3 months since it launched, SO have a lot to learn! In just a short amount of time though, WOW, being an entrepreneur is seriously hard work -- I could have 100 hours each day and wouldn't get everything done that I want to get done. How do you optimize your day? I have to keep my to-do list short. There are plenty of things that pop up throughout the day, and to be able to say "yes" to those, I can't have too much on my plate already. That and the good ole' saying: early to bed, early to rise. Who is the person/people who allowed you to imagine more? My family is always listening to my crazy ideas and plans. Sometimes they give me a little reality check - usually needed in those situations! But for the most part, they just add thoughts on top of my thoughts; just making my ideas that much more fun. Other than them, I get all my inspiration from about 20 bloggers, influencers and networks. I take bits and pieces from each person and string them together or twist them into my own - that's a lot of fun. What does imagining more mean to you and your story? When I moved to Atlanta, I was a tad bit grumpy. Sorry, mom! I felt pulled here due to location, but I really wanted to be in LA, NYC, or San Diego. The creative energy and social vibes in those cities just gave me life and I wanted to be a part of it. It took two years of living here before ATL Girl Gang came to life and sort of created that lifestyle for me. I thought I was alone in this feeling here in Atlanta, but turns out, almost all the girls I talk to feel the same way. Atlanta isn't necessarily on the map as far as creative energy goes, but I've learned that there are SO many amazing, inspiring and cool vibes here that just aren't spotlighted enough. Because this is something that hasn't been done here before, I'm totally just making it up as I go: imagining it all, if you will. If you could do more of one thing every day what would it be? HA, eat more cookies without gaining weight is my first and most honest answer. Real answer: lunches and dinners with friends. My day job is somewhat lonely as you're in the car working all day, so it's nice when you can get out afterwards and have a little social time. Unfortunately, if I did that every. single. day., my friends and I would all be broke! Favorite social media platform? INSTAGRAM, hands down. Obsessed with Instagram stories, posts, everything. I'm a super visual person, so it really is a lot of fun for me to play around on. Granted, that's one of the only platforms that we use for ATL Girl Gang so I'd say I'm slightly biased.